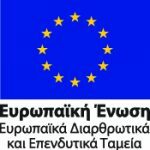 Line 2 – ΑΤΤΙΚΟ ΜΕΤΡΟ Α.Ε. The construction of Line 2, being part of the Base Project, commenced in November 1992. The 7 first stations of Line 2 in SEPOLIA – SYNTAGMA Section were handed over to the public in January 2000, while 5 additional kilometers with 5 stations in SYNTAGMA – DAFNI Section were commissioned in November 2000. 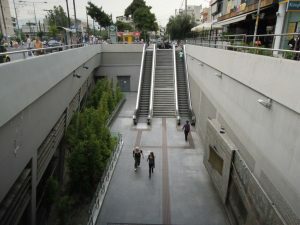 In early August 2004, AGHIOS ANTONIOS Station was handed over to the public within the framework of Line 2 extension towards the western suburbs of Attica Basin. This extension is 1,4 km long and serves 50, 000 passengers on a daily basis. SEPOLIA – AGHIOS ANTONIOS Extension is of major importance, since, in this way, the Metro passed beyond Kifissos river boundaries and reduced dramatically the traveling time of the residents of the western suburbs. Today, it takes just seven minutes from AGHIOS ANTONIOS Station to reach the city center (Omonia Square) and 45 minutes to reach ELEFTHERIOS VENIZELOS International Airport (with one transfer at SYNTAGMA Station) traveling safely, rapidly and comfortably. AGHIOS ANTONIOS Station is harmonically integrated into the surrounding area and enhances to a great extent the quality of daily life of the residents and the Metro users. The new section of Line 2 from Dafni up to Aghios Dimitros is an extension 1.2 km long with one station (AGHIOS DIMITRIOS/ALEXANDROS PANAGOULIS); 350m out of the 1.2 km consist in a triple track tunnel and 860m in a double track tunnel. This extension was constructed using the NATM and the Cut and Cover (C/C) methods. The whole project was constructed based on high standards set by ATTIKO METRO and includes power supply and distribution E/M systems, ventilation systems, pumping stations, lighting and fire protection systems, lifts and escalators. Moreover, up-to-date systems were installed for the operational needs of the Line, such as weak current systems, signaling, telecommunication and remote control systems, CCTV, public address, clock system and passengers’ information. The construction works for DAFNI Station – AGHIOS DIMITRIOS/ALEXANDROS PANAGOULIS Station extension were completed within 2004 and the station was commissioned on 05.06.04, following the reinstatement of the surrounding area. Nowadays, this Extension serves 45,000 passengers on a daily basis. The initial invitation to tender for Line 2 extension to Elliniko initially foresaw the construction of an elevated metro system with a bridge, extending over 5.5 km approximately, along the central island of Vouliagmenis Avenue, which would create significant sound and visual disturbance. Following a decision made by the Ministry of Infrastructures, Transport and Networks, the said tender procedure was annulled and ATTIKO METRO S.A. called for a new tender based on which the entire Line would be constructed below surface. A thorough examination of the construction method proved that the Line could be underground with a slight difference in the budget and& the time needed for the construction of the project. The contract related to the underground extension of Metro Line 2 to ELLINIKO was signed on March 8th 2006. The extension is 5,5 km long in total and includes 4 new stations: ILIOUPOLI, ALIMOS, ARGYROUPOLI and ELLINIKO, as well as an underground area for the stabling of eight trains to serve the needs of the extension. All new stations are 110m long, consist in three levels and there are entrances/exits on either side of Vouliagmenis Avenue. The tunnel has been bored using a TΒΜ-ΕΡΒ boring machine, whose cutter head will be 9,5m in diameter. The stations, the ventilation and Eletromechanical shafts, as well as the train stabling area were constructed using the Cut and Cover (C/C) method. This Line extension provides transportation services to the wider area along the axis of Vouliagmenis Avenue, i.e. the areas of the Municipalities of Aghios Dimitrios, Ilioupoli, Argyroupoli, Alimos and Elliniko. In particular, with the addition of the said extension to the Metro network, the daily ridership is anticipated has been increased by 83,000 passengers. On the contrary, daily trips by car will be reduced by 50,000. It is worth mentioning that the distance from ELLINIKO Station to the city centre (SYNTAGMA Station) will be covered in only 14 minutes, while by car in rush hour it takes more than 45 minutes!